The Galaxy S6 Edge debuts next week, a super-sized version of one of Samsung's most stunning phones. Unfortunately, it seems the phablet will also be joined by this unsightly keyboard case that's circulating online. The photo came from notorious leakster Evan Blass, who certainly surprised a lot of people when he shared it his famed twitter account. 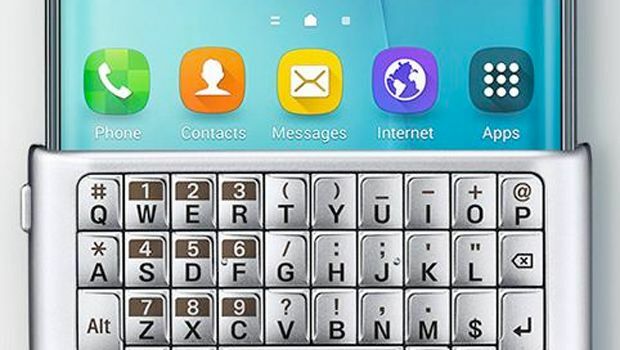 It shows the upcoming S6 Edge Plus rocking a slide-on case that gives users a physical keyboard. While a lot of people prefer the old-school way of having a proper keyboard, I think most of you can agree that it somewhat tarnishes the sleek look of the S6 Edge Plus. This could be a mock-up image that Samsung is just playing with, but then again, considering the size of the S6 Edge Plus – which is a hefty 5.7 inches – a keyboard accessory makes sense. If it's the real deal, then it's very possible we could see it at Samsung's Unpacked event on August 13, where the wraps will be taken off the S6 Edge Plus and Galaxy Note 5. We may well see the Samsung Gear A smartwatch tag along too. Previous rumours suggest the Note 5 is the more powerful of the two, packing the new Samsung Exynos 7422 SoC, while the S6 Edge Plus will apparently use the Snapdragon 808 CPU. The latter is also expected to have a 16-megapixel main camera with OIS, 32GB storage and a 3000mAh battery. Going on the renders we saw last week, our expectations are high.